I truly love Valentine's Day because it's the day Sweetheart asked me to marry him. We met in the Spring of 1959. We both sang in the high school a capella choir. One day I looked up to the row of bass singers and I saw this darling face smiling at me. I was amazed. He was so cute. We started dating and fell in love. On February 14th 1960 we drove to San Francisco to have dinner and see a movie to celebrate Valentine's Day. While we were having dessert Sweetheart gave me an engagement ring and proposed to me. We were married on July 17th 1960. This year we are celebrating the 53rd year of our engagement. The first 30 years while the aca children (from the movie Pitch Perfect) still lived at home we would go out to dinner alone and reminisce about our wonderful evening so many years ago. But, for the last 23 years we have stayed home for dinner. Imagine we're sitting in front of the fireplace. Enjoying some conversation about our date nights in San Francisco during the Summer and Fall of 1959. Sweetheart and I would double date with another couple driving to the City of San Francisco on Friday night. We spend many evenings on Fisherman's Wharf eating delicious sea food and going to the beautiful movie theaters - being entertained by the great movie stars of the 50's. What a fabulous experience for a couple of kids from Santa Clara. (A town of 18,000), but that was just about to change. THE COMPUTER AGE HAD ARRIVED IN SILCONE VALLEY. The beautiful glassware is from my mother's estate. The candle holders are a thrifty find. I have put the candle guards on to keep the candles from dripping on the satin tablecloth I bought at TM on clearance. The china is 'Ralph Lauren' a gift we received for our 50th wedding anniversary. Silver flatware 'First Love' is our wedding pattern. The crystal vase is another beautiful thrift find. I found this pair of silver salt and pepper shakers at the thrift shop also. Oh~My the beauty of flowers. It's truly amazing...The color and texture of this bouquet. This month is all about romance and flowers. I thought of red roses for this table, but the pink carnations called my name while I was shopping for groceries this week. I love the baby's breath. One last look at a romantic dinner table. I love the lasting ability of carnations. We will be enjoying this bouquet for another week. The golden rings represent the circle of everlasting love. I would love to share my bouquet with my friends and followers. Oh, Betty! Love your romantic tablescape! Everything is so soft and pretty. I love that sweet little silver heart shaped basket. I, too, married my high school sweetheart and Valentine's Day is his birthday - we are looking forward to a big day today - hope you have one, too! Wow! How I love to know that true love exist. Today is my & hubs 28th yrs met the first time and still our love still going so strong. What a lovely & romantic settings. I love every details. Happy Valentine's Day to you & your life soulmate. Such a beautiful story of love and just a beautiful table! Happy Valentine's Day! I love that you've found so many thrifty treasures! Those salt and pepper shakers are beautiful. Hope to have the same luck someday :) I loved seeing your wedding photo and your story of how much Valentine's Day means to you. Thank you for sharing! Happy Valentine's Day! Absolutely beautiful! So elegant and a wonderful story of your marriage. What a joy to hear! I wish you many more amazing Valentine dinners. Your menu sounds wonderful. Happy Valentine's Day! What a beautiful love story. Thank you for sharing it with us. My husband I will be married 30 years this August. Sounds like God has truly blessed us both! I am sharing vintage Valentine's Day cards today. Stop by for a visit! I loved your Romantic table and I also clicked back to your 50th Anniversary Post. You have an incredible marriage! When love lasts, as in your marriage, it becomes an inspiration to us all. I'm drooling about your 50th Anniversary china! What a gift! And I love the sweet pink carnations! What a delicate color! They were perfect for today! Happy Valentine's Day to you and that wonderful guy you married! Beautiful and elegant table for two. The white and gold dishes are lovely and the centerpiece in pink carnations is gorgeous! Hope you are having a lovely VALENTINE'S DAY and I hope the night as well. Thank you for your sweet and kind visit. What a lovely table...sweet love story, too. My husband and I spent Valentine's Day in San Francisco 1988 and had the most wonderful time. What a beautiful setting, we also had a romantic dinner in front of the fireplace, menu wasn't as nice as yours, but we both loved it. Your dishes, wine glasses , silverware are all so pretty, enjoyed your post. God bless. Sweet love story. Congratulations on your upcoming 53 years of marriage. Your table is lovely with your beautiful RL china and the pink carnations. Happy Engagement Anniversary. Nice romantic table setting. Love those pink carnations. Happy Pink Saturday. Your tablescape looks romantic in front of the fireplace. 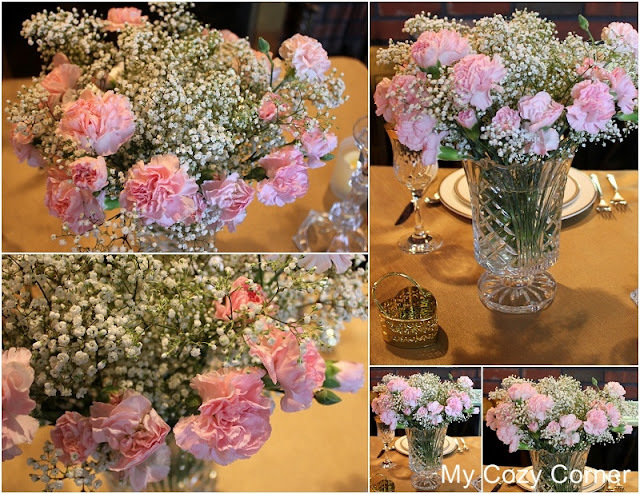 The pink carnations and babies breath are lovely. Looks like you had a wonderful valentine's day with your sweetheart! This looks like a very romantic evening you have planned, Betty. The table looks lovely! My favorite things are those wine stems (gorgeous), the Ralph Lauren china, and the silver salt and peppers. I have a crystal vase and candlesticks very similar to yours. They always look so pretty on a formal table, don't they? It's fun to see your wedding pictures; I always think black and white wedding pictures look so elegant. :) Visiting from Seasonal Sundays -- have a wonderful weekend!